Springy strands of noodles coated with the gooey minced pork sauce; a signature of Soong Kee that has stood the test of time. A good seven decades of legacy relates to exceptional fan base and coming here feels like traveling through the tunnel of time. I still remember the first time I fell in love with KL style of beef noodles. 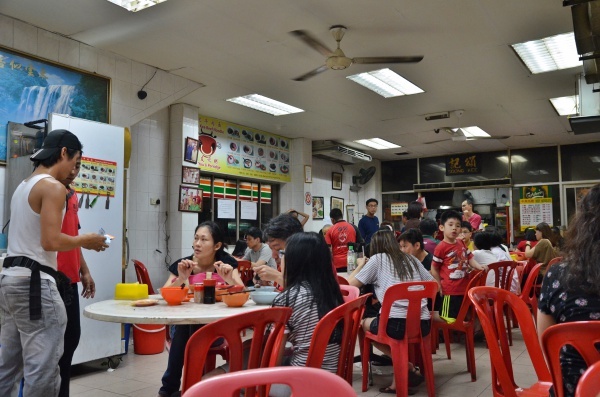 It was at Shin Kee in Chinatown, a stone’s throw away from the Petaling Street entrance. Whereas in Ipoh you don’t usually find beef noodles in the thick of all the rage (in fact, seldom do you see beef served in most Chinese hawker stalls; aside from a selected few like Yik Sun Hakka Mee and Buntong beef noodles), there are quite a number of good ones in town; especially centred around the Chinatown and Golden Triangle. Shin Kee Beef Noodles Specialist was the first, followed by Lai Foong directly opposite the street. Then Ngau Kee around Tengkat Tong Shin came next, and finally we tried Soong Kee Beef Noodles at the junction of Jalan Tun HS Lee and Jalan Tun Tan Siew Sin. For today, after a good half decade or more, we were back on a revisit to Soong Kee for dinner. 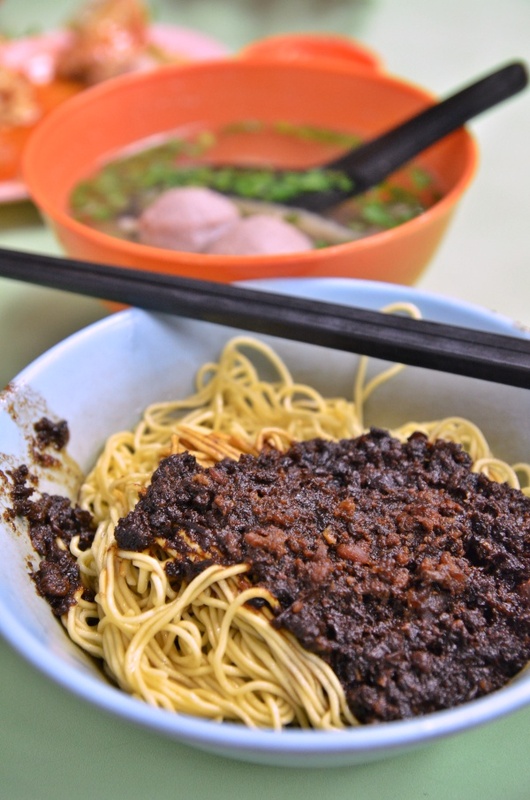 Always make it a point to try their dry version of the beef noodles for the savoury minced pork sauce; as you will still get a bowl of the hearty, sweet soup brimming with beefy flavours. The crowd swelled to an almost full capacity; spilling to the streets. Literally. But of course, people do come for Lao You Ji/Low Yau Kee Porridge; that humble porridge stall parked in front of Soong Kee. With a grand 40 years plus of history, you should not take them lightly as well. We were a tad too late that Saturday evening; the mixed pork (offals, pork balls and all the works) porridge was sold out. Hence we settled for the poached chicken porridge instead; a separate portion of glistening, smooth chicken poached to a texture that’s almost half-cooked yet without unsightly bloody marrow bits. And the porridge the man churned out was exceptional. Smooth without starchy, lumpy bits that destroy the experience, this was almost as good as the way Hong Kong peddlers serve theirs. Still, I would have given anything to try that pork version with crispy chunks of deep fried intestines. Someday, I tell you .. I will be that early bird. Or you can also try the sashimi fish porridge; whereby you have the option (which you should) to dunk the slices of raw fish into the piping hot porridge and cook them to your liking. Just like the other famous name; Hon Kee at Petaling Street. But then again, its the BEEF NOODLES that we came here for. And after bouts of price hikes, I guess they need to move on with the times as well. A small bowl for RM6/USD2, the portion was barely enough for one. At an additional RM1, you should upgrade to the larger serving. The noodles had this slight alkaline taste to them this time, while the minced pork sauce was still delicious, yet much lesser punch. To a point that if your strands of noodles ain’t coated in the minced pork sauce, they’re tasteless. Thankfully, the bowl of sliced beef, beef balls and cow’s tripe satisfied whatever cravings for anything beefy that I had. Only that … once again, the portion has been reduced considerably. Either that or years ago, I was easier to appease. Oh well. Anyhow, comparing the noodles alone I would say Shin Kee fared that slightly better than Soong Kee. But the limited seating capacity in the former had me thinking twice all the time. 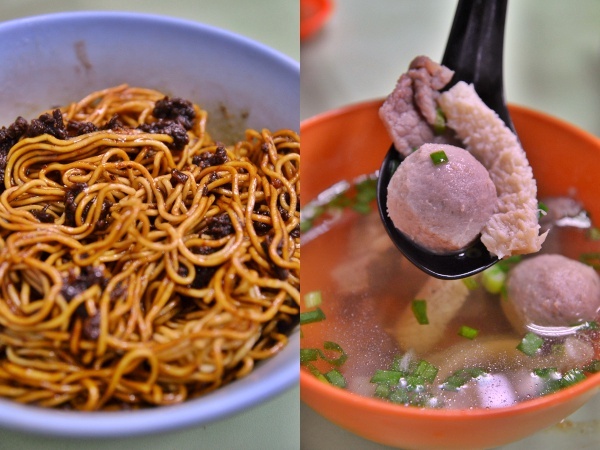 Soong Kee has that added advantage of serving better beef balls and the alternative of a delightful bowl of tummy-warming porridge from Low Yau Kee. Anyway parking’s a nightmare around this area. They are so limited that you either park really a distance away and walk over (though please be careful of your belongings as the streets are poorly lit) or park haphazardly by the sidewalks (and everyone does this), finish your food and leave in an instant. Chinatown’s swarmed by foreigners these days and the potholes are getting worse. The buildings looked dilapidated and the congestion caused by buses parked by the roads is a nuisance. Somehow or rather … I just feel that Chinatown has lost its lustre. Maybe it’s time that someone starts to act on their pledges and promises made in the heat of the GE. The beef ball noodles and pork porridge hungry crowd spilled to the streets. Literally. In the late seventies, the Bee Gees era, you would see a bunch of school kids jam packed the upstairs of Soong Kee every fridays after visiting Naha shop at the back for their football boots. I am one of them.The taste has not changed a bit until now, their outlet at Lot 10 Hutong is equally good, attracting more Tan Sri now. In the eighties, Ngiu Kee at Alor was best when the boss, Ngow Lou was in charged, now with foreigner cook, you may just ignore them. There are not many others around, Shin Kee is still a good choice, the opposite Lai Fong is soapy type (now has gone sterile) and Yin Kee at Taman OUG (formerly Jalan Peel). 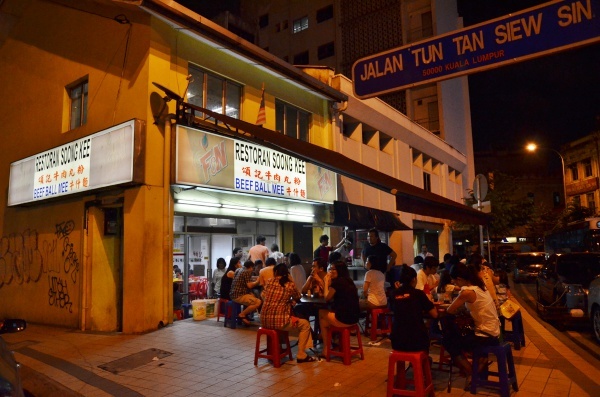 The Seremban old market dry type beef noodle also can not be missed. a look at the spelling on quite a few oof your posts. Several of them are rife with spelling issues and I iin finding it very bothersome to tell the reality then again I will surely come back again. Hurrah, that’s what I wass looking for, what a stuff! present here at thios website, thanks admin of this web page.